The predictions and statistics for this week, the BMW Masters (European PGA Tour) and the CIMB Classic (US PGA Tour), are now available on Golf Predictor. Both major tours are in Asia this week and like last year, the Kuala Lumpur Golf and Country Club, the home of the Maybank Malaysian Open on the European Tour for the past few years, is hosting the US Tour. As most of the field is from the US Tour, course history from the European Tour events is not much of a factor. Although there is no Rory McIlroy in China this week due to his impending legal difficulties, there are several other European big names teeing it up. Thorbjorn Olesen (ranked 10th by Golf Predictor) won the ISPS HANDA Perth International on the European PGA Tour. The 24 year old Dane won his second tour title with a comfortable win in Australia. On a day where European Tour cards were up for grabs, Olesen held his nerve after a mid round wobble to win by three shots. Our top ranked player, Victor D|ubuisson, finished in second place and we had six of the top fifteen plus ties (6/18) overall. Robert Streb (ranked 36th by Golf Predictor) won The McGladrey Classic on the US PGA Tour. The 27 year old American came from behind to win his first PGA Tour title in a three man play-off with Will MacKenzie and Brendan de Jonge. After Streb stormed home with 63 to set the clubhouse target, he played solid golf to pip de Jonge with a short range birdie at the second extra hole. After tipping him and backing him at 66/1 each way (thanks to the new Performance Likelihood metric), it was a good week for me too! Our top ranked player, Matt Kuchar, finished in tied 22nd and we had only five of the top seventeen plus ties (5/21) overall. The predictions and statistics for this week, the ISPS HANDA Perth International (European PGA Tour) and The McGladrey Classic (US PGA Tour), are now available on Golf Predictor. Several big name players are making the long trek to Perth to join the other (mostly local) competitors. Along with the journeymen desperate to retain their playing rights for next year, Victor Dubuisson, Jason Dufner and Charl Schwartzel are also competing in Perth. There is also a fairly decent field in Georgia, where Matt Kuchar and Zach Johnson are among the bigger names teeing it up. Scott Hend (ranked 21st by Golf Predictor) won the Hong Kong Open on the European PGA Tour. The 41 year old Australian won his first tour title on the first hole of a play-off with the colourful Angelo Que. Having had to conjure up a sand save on the final regulation hole from a plugged lie, Hend took the title after Que failed to get up and down for par from just off the green on the first play-off hole. Our top ranked player, Miguel Angel Jimenez, was ill apparently and missed the cut, and we had only five of the top fifteen plus ties (5/20) in total. Mikko Ilonen (ranked 12th by Golf Predictor) won the Volvo World Match Play Championship on the European PGA Tour. The 34 year old Finn won his second title of the season with a 3&1 victory over the more fancied Henrik Stenson. Golf Predictor isn't designed for match play events, but as the annual joke goes, we had sixteen of the top sixteen!! Ben Martin (ranked 75th by Golf Predictor) won the Shriners Hospitals for Children Open on the US PGA Tour. The 27 year old American won his first tour title with a late flourish of an eagle on sixteen and a closing birdie. Our top ranked player, Billy Horschel, saw his recent hot streak come to an abrupt end as he missed the cut. Overall, we had thirteen of the top eighteen plus ties (13/27)*. *With withdrawals and no shows, Bohn makes top 27 in GP rankings. The predictions and statistics for this week, the Volvo World Match Play Championship (European PGA Tour), the Hong Kong Open (European PGA Tour) and the Shriners Hospitals for Children Open (US PGA Tour), are now available on Golf Predictor. There are three events on the two major tours this week. Even though Golf Predictor is designed for stroke play events, the Volvo World Match Play Championship has also been put through the wringer as usual! There are several European Ryder Cup stars competing and one American, Patrick Reed. With his rookie performance at Gleneagles, it was a good decision to cross the pond again! That doesn't leave much star power for the more modest Hong Kong Open. Miguel Angel Jimenez will be defending his title and hoping to raise his own record of oldest winner on the European PGA Tour yet again. This must be the first time that a senior has led the rankings/betting in a European Tour event! Meanwhile, the Las Vegas event on the US PGA Tour has a few biggish names competing this year. Chief among them is Billy Horschel, who must be hoping that his hot streak hasn't come to an end after a few weeks off! Alexander Levy (ranked 21st by Golf Predictor) won the Portugal Masters on the European PGA Tour. The 24 year old Frenchman won his second title of the season and his career in soggy Vilamoura. After storming to a record equalling -18 after two rounds, Levy only hit four shots over the weekend before the event was finally cut to 54 holes and he was deemed the winner. Our top ranked player, Francesco Molinari, was deemed to have missed the cut and we had seven of the top seventeen plus ties (7/20*) in total in the rain affected event. Sang-Moon Bae (ranked 80th by Golf Predictor) won the Frys.com Open on the US PGA Tour. The 28 year old South Korean won his second tour title, despite a nervy final day performance. However, the lead Bae had built up over the first three rounds proved to be sufficient in the end as no one made a real run at him. Our top ranked player, Matt Kuchar, finished poorly on Sunday for tied 21st and in a tournament traditionally hard to predict (usually due to the relatively poor field and this year with a new course), we had only four of the top twelve plus ties (4/16). *Ramsay withdrew, thus promoting Levy into the top twenty of the GP rankings. The predictions and statistics for this week, the Frys.com Open (US PGA Tour) and the Portugal Masters (European PGA Tour) are now available on Golf Predictor. It's the first event of the new 2014/15 US PGA Tour season, and unlike last season, a few big guns will be trying to get their new campaigns off to a flying start. While several Ryder Cup stars are teeing it up in California, the field in Portugal is more modest, where Ireland's in-form Shane Lowry will be one of the leading contenders. 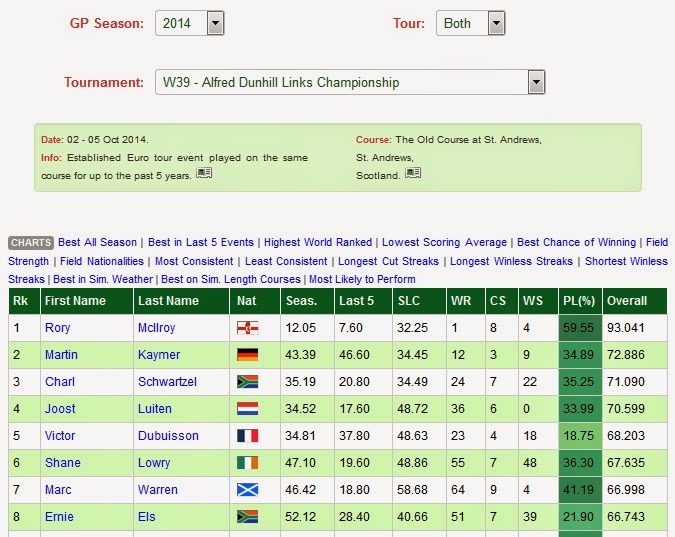 Oliver Wilson (ranked 23rd by Golf Predictor) won the Alfred Dunhill Links Championship on the European PGA Tour. The 34 year old Englishman finally won his first tour title with a one shot victory in Scotland. After nine runners up finishes and a career slump over the past few seasons, it was an emotional victory for Wilson. Our top ranked player, Rory McIlroy, finished in tied 2nd and we had nine of the top eighteen plus ties (9/24)* in the weather affected event. *Dredge didn't play so Uihlein is promoted to the top 24 of the GP rankings.